Did you know that there are search engines that are not Google? There are many alternatives to Google, but one search engine is a bit different from the rest. 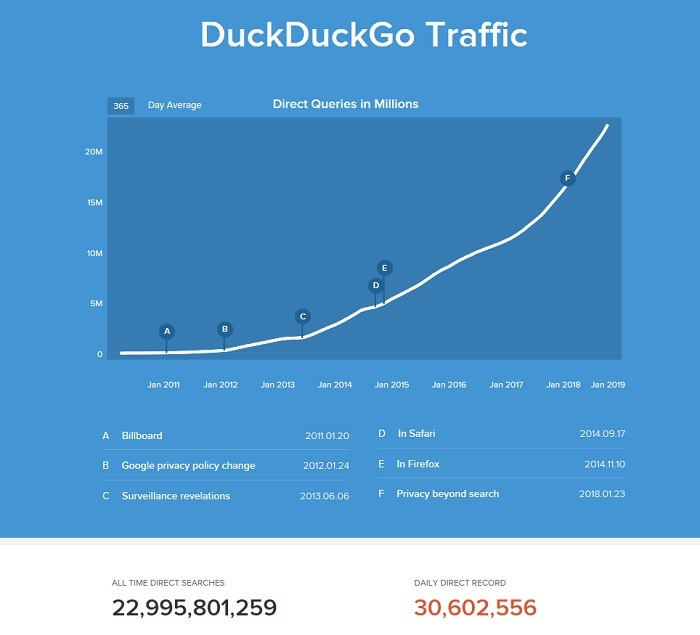 In the age of online privacy, Duck Duck Go has been a search engine that is driving more search queries daily through their service. DuckDuckGo began in 2008 as a small operation in Pennsylvania. In 2018, DDG announced that it has surpassed 30 million private searches a day which is impressive still as a small operation in PA.
With the growth of DuckDuckGo, Google Analytics continues to count visits from this search engine as referral sessions. You will see in your report that traffic from this search engine will look like DuckDuckGo com referral which is frustrating. 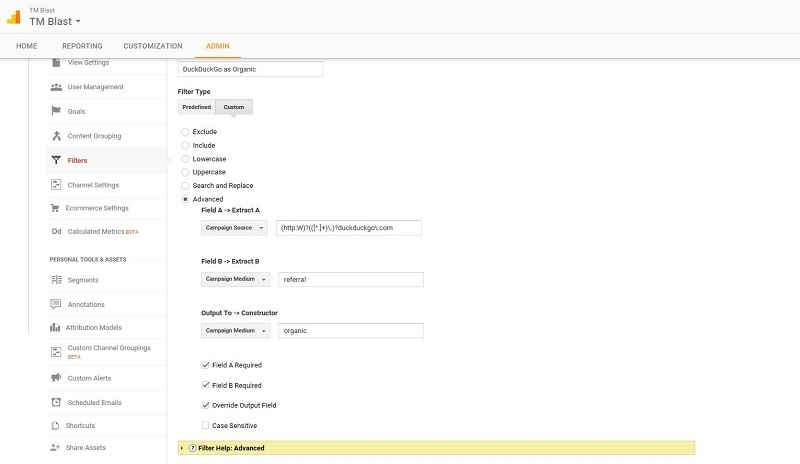 To get DuckDuckGo tracking correctly in Google Analytics, you will need to manually add this as an organic search source within the platform. There is no DuckDuckGo Analytics platform, so you are going to have to rely on Google. The first thing you should do is split out the view of your website into multiple profiles. You should have a raw listing which does not have any filters on your site and then have at least another listing that has filters like the one you are going to create now. Custom filters are a great way to split your traffic correctly, so read up on that link I provided if you are unsure what to do. Assuming you are good with the step above, you will need to head to the admin–> view–> filter section within GA. From here, we will need to create a new advanced filter. This picture below shows the breakdown of what you need to add. The way to read this is that you have to choose custom under the filter type and click on advanced. From there, you need to specify where the source you want to change is coming from. You then have to label that this medium is the referral and that it should go to organic. The second thing you need to do is add DuckDuckGo as an organic search source in Google Analytics. To do this, you need head to admin –> tracking info –> organic search sources. Once you get there, you can add DuckDuckGo like this. How to Test if this is Working? The most precise way to test to see if you got Google Analytics to work is to use the real-time data report in Google Analytics. Perform a search on DuckDuckGo and go to your site from their results. If you see the visit marked as organic, you are all set! This picture below illustrates that duckduckgo.com is in fact organic in the medium report. How DuckDuckGo is Different from Google? The main difference between DuckDuckGo and Google comes down to user privacy. DuckDuckGo search engine does not track your searches unlike Google and other search engines. What I mean by this is that Google and Bing mine your search behavior to serve targeted ads to you. There is nothing wrong with that, but DuckDuckGo was created to protect user data as their search online. You might not notice this, but Google can show personalized searches for you on topics that they feel best to serve your intent. Again, there is nothing wrong with that, but you might have a slightly distorted view of the web. If you are interested in learning more about this, you can check this out. Right after Edward Snowden came out about the NSA and tracking users, DuckDuckGo has seen a dramatic rise in the number of searches. In fact, DuckDuckGo marks this moment as one of the primary reasons why they had an increase in daily queries. DuckDuckGo will most likely never research the level of Google, but that does not mean it’s not worth your time. Organic traffic from any search engine is essential within SEO, so you want to be recording everything correctly to give yourself proper credit. Here is a Screenshot of some of DuckDuckGo’s traffic over the years. Why Does Google Analytics List DuckDuckGo as Referral Traffic? The reason that this is the case is that this search engine is HTTPS encrypted with its URL. That means the keywords that you type in do not pass over to another party. Since that is the case, GA defaults this as a referral visit from the source which is DDG. The best part of these steps is that you do not need a developer to add them. You do need to have access to Google Analytics and have the ability to make the changes above. This search engine has a lot of great features that will enrich your experience.